Guest writer, Lily, shares her thoughts on the event that led to gender equality in the automotive industry. Made in Dagenham. This is the movie with a running time of 112 minutes and received 4 stars out of 5 in The ViewLondon Review back in 2010. It is an enjoyable, fun-filled comedy movie depicting the real story of a group of women on serious strike, to protest the unequal pay treatment back in 1968. This actually happened in the Ford factory! The actions of this group of women eventually led to the Equal Pay Act in 1970. Of course, if we really want to trace back to the first wave of worldwide feminism, it had already started in 1809 in USA, where married women were first empowered to execute wills. Today, my interest is in this group of women who worked in the Ford factory as sewing mechanists, as that is the field that I come from – the automotive industry. Without this group of women, the ripple effect that influenced equal pay in other countries would not have taken place. My curiosity drove me to find out if there was a difference in treatment towards male and female service advisors at the auto service centres in Kuala Lumpur. I was so glad to discover that they are given equal opportunities! In fact, high performing female service advisors even have a higher pay, which is based on a merit system. The situation has changed so much that even more female mechanics have entered the aftermarket automotive industry. X-1R’s article, in its newsletter dated 26 November 2012, titled No More “Monopoly” for Men in the Workshop, features one such lady mechanic. Let’s go back to Made in Dagenham. Back in those days, all car seat covers were manually sewn by the sewing mechanists, who were watched and timed for quality and productivity. Ford had set the pay rates for ‘skilled male’, ‘semi-skilled male’ and ‘unskilled male’. However, for women, there was only one rate – the ‘women’ rate – and it was only 87% of the ‘unskilled male’ rate. What a blatant discrimination from today’s society’s perspective! I believe even men of today will agree with me on this. 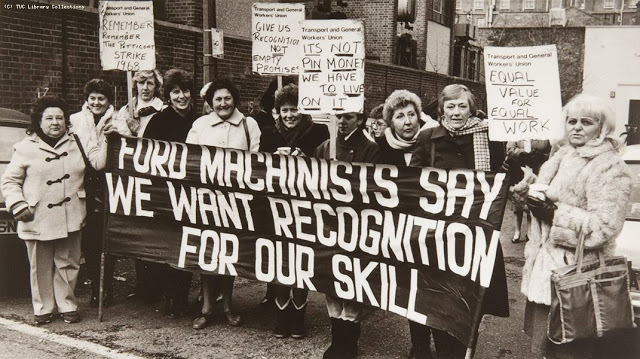 Besides receiving lower wages regardless of their skill level, Ford women had to work under very harsh working conditions at the Dagenham plant. They had to find ways to stuff the holes in the roof of the rundown premise to keep themselves warm. The Ford women’s grievances were not attended to by the company. Various attempts to gain the attention of the company failed. Sheila Douglas then led the women on a strike, causing production to come to a standstill, even though she was unsure if it would work. The strike did not go smoothly at all. These brave women received angry letters from the public and faced opposition from home in fighting for their cause. Finally, this came to the attention of the Secretary of State for Employment, Barbara Castle, who eventually brought the issue to the ministry and effected fair wage adjustments over the course of 2 years. Today’s Ford supports “equitable and inclusive employment to foster a diverse work environment”, as it states on its corporate website. Hyundai Elantra named 2018 Best Value Compact Car in the U.S.